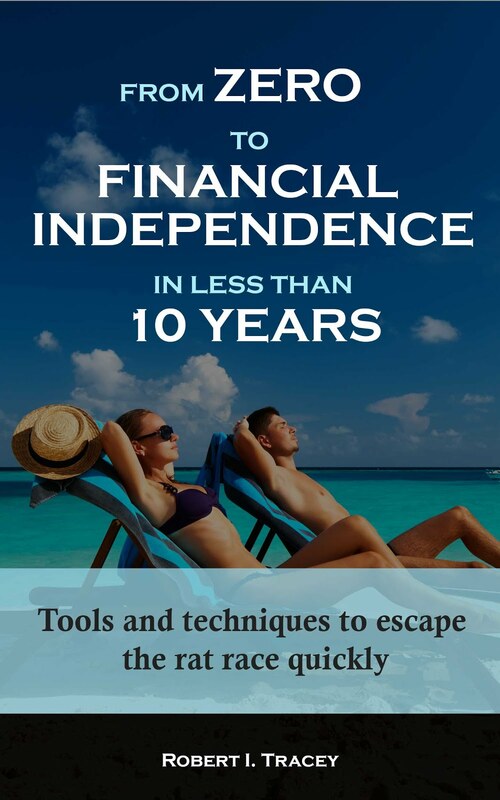 This is the regular quarterly feature that demonstrates the progress a person actively living the tools and techniques mentioned on this site can make towards early financial independence. It also forces me to hold true to those tools and techniques because if I can’t live by them then this site becomes hypocritical like so many other sites out there and I become nothing more than a hypocrite like so many others with vested interests. I am now into a fifth year of aiming to save 60% of my earnings, which I define as my gross (ie before tax) earnings plus any employee pension contributions. This remains a very tough target in the current age where we have increased taxes and prices due to unrelenting inflation. I feel fortunate to have been given some respite here earlier in the year with a 3.5% salary increase after receiving nothing in the previous year. To maintain my Save Hard focus I continue to looking for ways to both Earn More as well as Spend Less which certainly requires frugal living and little to no consumerism. This continues to be a very positive experience however when you live in a city, London, where it appears as though everyone thinks the world is going to end tomorrow it can become difficult to stay on the path I have chosen. By tracking my net worth on a weekly basis, which also gives me a % towards early retirement figure, plus before making any purchase taking some time out to ask myself if I really need what I am about to purchase which includes considering will it help improve my health or increase happiness I typically don’t stray for very long. Particularly as I carry the knowledge that by deferring that spend I get one step closer to early retirement which will mean a big reduction in stress plus the option to only work when I want and then only because I enjoy it. Last quarter I managed a savings rate of 67% of earnings however I also advised that a large portion of that was caused by a HMRC error. They are now in the process of recovering the “interest free loan” they provided me with which has caused a fall back in savings rate to 64% for the first half of 2013. These savings have gone into both my own investments plus a portion has been provided to my better half to help keep her financial independence goal on track and in sync with my own. The payback to HMRC still has some way to run so I’ll need to stay focused if I’m going to keep that savings rate above 60% in 2013. Saving hard half quarter end score: Pass but I need to stay focused with the current increased tax pressure on my shoulders. 12.2% (down from 12.4%) held within ISA Wrappers. 100% of which is invested within the TD Trading ISA. Tax efficiency quarter end score: Pass. I’ve gone from 66.9% tax efficiently invested to 68.7% during a period where no NS&I ILSC’s were available. I believe I have maximised the opportunities made available to me so far this year. Some care is needed going forward though as while I want to keep using the tax benefits of Pensions I don’t want all my eggs in an easily tinkered with by government basket. For me this is particularly important as I expect to be retiring in my early 40’s leaving a long time for government to make changes between early retirement and government mandated personal pension access age. Investment expenses also continue to be treated as the enemy. These have fallen slightly from 0.37% per annum to 0.36%. I’m choosing to salary sacrifice large amounts into the “expensive” insurance company pension fund offered by my employer. This enables me to take advantage of an employer contribution match up to a certain point plus my employer also contributes a portion of the employers NI saved. For me it means I end up with more wealth even after the higher fees. As soon as I get the chance it will of course be transferred into my Sippdeal SIPP. If I’m Investing Wisely I should be able to beat (or at least match if I was 100% Index Tracking, which IMHO is an admirable pursuit) an Index Benchmark. For me that Benchmark remains a simple UK Equity and Bond Portfolio aligned in percentage terms with the building blocks of my own portfolio which is then rebalanced once every year. Today that benchmark allocation remains at 69% UK Equities and 31% UK Bonds. The 2 indices I use to replicate that benchmark are the FTSE 100 Total Return (Capital & Income) Index which this quarter has returned 6.9% and the iBoxx® Sterling Liquid Corporate Long-Dated Bond Total Return (Capital & Income) Index which has returned -1.0%. The return of my benchmark for the quarter is therefore 4.5%. In contrast my portfolio has provided an annualised return of 5.7% and a personal rate of return of 2.8% meaning for the first time in a long time I have failed to beat my benchmark. I’ve also failed to beat it by a long way. Is the shine coming off my strategy? Of course only time will tell but for now I’m staying the course. This is a true return which allows for the fact that large levels of contributions are being made continuously so is a fair comparison. Investment return first half of 2013 score: Fail. I have failed to beat my benchmark. Even allowing for the fact that my portfolio sees expenses (fund and wrapper expenses, investment spreads, trading commissions, withholding tax on some investments and savings interest tax deducted at source) it’s still a big difference and one I’m not happy with. That said I need to remember this is a long game – it’s a time in the market and not timing the market game. 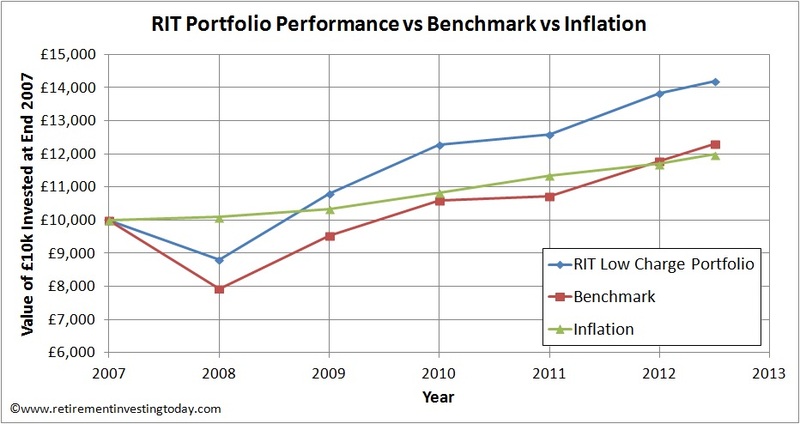 Thankfully the long game still looks good with the chart below tracking the performance of my portfolio, my benchmark and inflation (RPI). Note that the chart assumes a starting sum of £10,000 which is not my portfolio balance at that time but is instead simply a nominal chosen sum to demonstrate performance. As always I never reveal my portfolio values in £ terms as it’s irrelevant to readers as we all have different earnings, investments, risk profiles, savings rates and target retirement amounts. Since then end of 2007 the benchmark continues to beat inflation albeit by a small amount. Inflation is growing at a Compound Annual Growth Rate (CAGR) of 3.4% with the benchmark at 3.9%. In contrast my portfolio has increased at a CAGR of 6.6% which is down from 7.3% at the end of Quarter 1 2013. In real inflation adjusted terms that’s now 3.2% (down from 4.0%). My whole investment strategy since 2007 has been to generate a Real Return of 4% over the long term and so I’ve fallen behind that target. This is what all that Saving Hard and Investing Wisely is about. When I started this site in November 2009 I stated that my aim was to retire (which I define as work becoming optional) in less than 7 years. Today we are nearly 3 and ¾ years on and assuming I can continue to save at expected rates and can achieve a real return of 4% I forecast that early retirement will come in about 2.5 years from today when I’ll be 43 years of age. That will be a bit less than 7 years from waking up to what the game was all about to goal achieved. Even though my investment return has been subpar in the first half of the year my net worth continues to grow quickly. 41% of the wealth increase year to date has come from Saving Hard with 59% coming from Investing Wisely. You can see my progress to early retirement in the chart below. 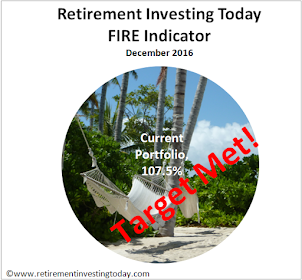 At my end of 2012 review my Progress to early retirement was 65.2%, by Quarter 1 2013 it had exploded to 70.0% and today finds itself at 71.2%. Progress is defined as my Current Investment Wealth divided by My Retirement Number. Retiring early quarter end score: Pass. My strategy of Saving Hard and Investing Wisely still has me heading in the right direction at good pace. I’ve moved 6% closer to retirement in 6 months. So all in all I’m going to call a mediocre 6 months. 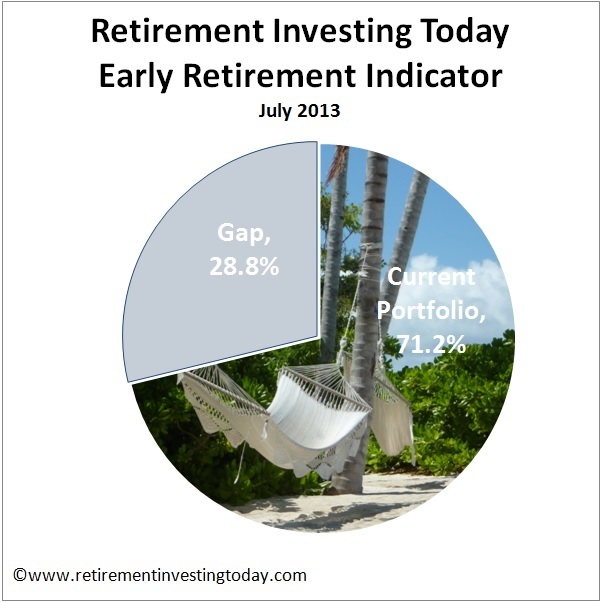 Progress to retirement remains good but I am concerned at that poor investment return year to date. How did you do? Are you happy with your achievements? Thanks for the update - things seem to be more or less on track. Got to admire the discipline to tuck away over 60% of earnings on a consistent basis. I was just wondering whether using your benchmarks is causing unnecessary concern as your portfolio has a wide mix of UK equities, cash, bonds, property, commodities and international equities. Would the FTSE APCIMS Private Investor Stock Market Balanced Index provide a more closely matched benchmark? Anyway, good luck with your target by 2016! The benchmark was set at the beginning of my journey back in 2007. It was designed to be the Simplest Investment Portfolio that I could think of at the time. I went for a simple portfolio as I was trying to assess whether I should go to all the effort my current portfolio requires or whether I'd be better off with a simple two fund portfolio which took "5 minutes" a year to manage allowing me to then spend the rest of the time "fishing". Up until now it's been well worth the effort. The proxy you mentioned might be closer to my current portfolio but it would veer away from my original intent. My portfolio for 6 months is around 8.6%. Equity only, heavy on emerging markets and currently increasing small caps positions. Also, heavily loading emerging markets on dips now - enjoying suppressed valuations due to irrational market behavior driven by US fed. Congratulations K. You're well ahead of my feeble year to date efforts. As you know I only have 5% of wealth targeted to Emerging Markets. My EM's predominantly consist of MSCI Emerging Market Trackers which when priced in £'s are down 10.5% year to date. Dividends would add 0.6% for a total return year to date of -9.9%. Would you be prepared to share what EM's you hold that can beat an EM Tracker by such a margin? I have limited exposure to Small Caps other than what sits within my FTSE All Share Trackers. Well, I am flat on emerging markets component, but it compensated by the rally in US/UK stock and some other components. I tend to go Active with non-trivial high risk and reward allocations such as emerging markets. Here is the fund - GB0030881550, I see its YTD as -0.75%. But I am actually happy with current prices due to low valuations, hoping for a large move up in 1-3 years. In my view small caps by nature are for picker and require a good manager to get good results. Check this trust out - GB0000175058. Thanks for sharing K. Not sure what's happening with my tracker as your JP Morgan Emerging Markets A - Net Accumulation fund says it's benchmark is the MSCI Emerging Markets Index which is what I'm trying to track. Morningstar suggests it's down by -0.8% as you mentioned and that its beating the index by 1.5% in 2013. That suggests I should only be down be 2.3% less fees and not the 9.9% I am. I think it's time to find a darkened room to try and find the gap on my side. Thanks for the small caps F&C Global Smaller Companies reference. I'll be sure to take a closer look although at first glance I'm not sure if I can go to the "dark side of the force" particularly given the ongoing charge of 0.81% + 10% of any outperformance. 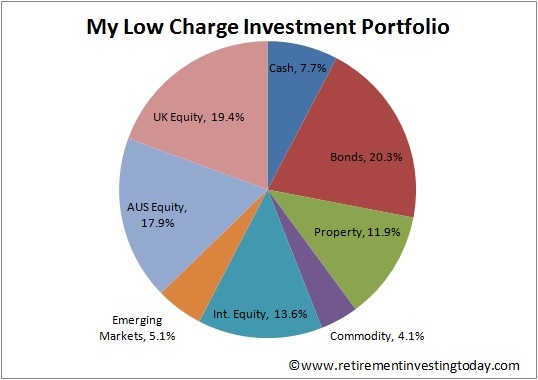 Why is so much of your investments in Australian equities? Are you planning to retire in the UK or in Australia? Assuming you're thinking of going to Australia, does your Retirement Number take the high cost of living and the bad exchange rate into account? What kind of visa do you expect to receive if you're not planning on working there? When I first built the strategy I wanted a foot in both camps to give me an option of early retirement in either location. As time has gone on and after having had an opportunity to spend some time in Australia it now looks like a very unlikely retirement location before I even consider XE or Visa's. Today if asked I would say the likely location is either somewhere in the UK (which I have grown to love more and more in recent years even with all the nonsense that goes on) that is not the South East or a couple of likely European countries. I haven't altered the financial strategy as up until now it has worked well for me and I don't want to be changing something so important as each of my non financial thoughts develop and alter. Once I have a final location 99% locked then I may rejig but until then it would just be churn. Thanks for your reply, RIT. I was curious because I'm considering moving to Australia and so it would have been nice to share experiences. For example, I read in an earlier comments of yours that you don't believe salary sacrifice at the 20% tax rate makes sense. This concern does imho not apply if someone plans to retire in Australia as you can transfer a pension to Australia using the Qualifying Recognised Overseas Pension Schemes (QROPS) scheme. This means that you save 20% tax in the UK when paying in (plus potentially NI) and pay zero tax in Australia once you retire and access your funds. Anyway, it would be nice to hear why Australia is no longer on your list of retirement options after spending some time there. Maybe you can share your thoughts on retirement locations in a future blog post. Thanks for your blog. I found it via Monevator and find it very interesting! Glad you find the site interesting Martin. - if you transfer more than 6 months after becoming an Australian resident resulted in you having to pay tax at your marginal level on any growth over that time. - the transfer was considered a non-concessional contribution which had some strict limits on how much could be transferred. Anything over that limit was taxed. At a top level why wasn't Australia right for me? I spent time in Queensland (the Southern States may be different and it's something I will explore in the future) and I must say it's a great place to holiday but couldn't see myself living there. The key problems at a very high level were that house prices are just crazy, the place really seemed to have sold its soul to the mining industry, there was absolutely no history at all and I found the locals to be generally culturally insensitive. The 20% rate is really 32% when you take NI into account. And the 40% rate is really 42% or more if you earn over £50k and have children. Why do people obsess about avoiding 40% tax by paying into SIPPS but aren't worried about trying to avoid 32% through salary sacrifice. The employer's NI is a further 13.8% on top of either. How do you plan to generate a passive income stream when you finally retire ? Believe you only have a few HYP shares. Are you considering Equity & Bond ETFs , Investment Trusts ? Go to New South Wales to get a better sense of Australia, or failing that Melbourne! Much better suited to the likes of us. Even the Australians think Queensland is for nutters. I think you're simple portfolio benchmark is always likely to have very good six month stints from time to time -- your more complex portfolio can only really show its legs over longer time periods. Good to keep watching, but I wouldn't sweat six months too much. Adelaide is a gem. A mediterranean climate is so much more enjoyable than a subtropical one: it's low humidity heat in summer vs high humidity.